Solar powered, environmental friendly. 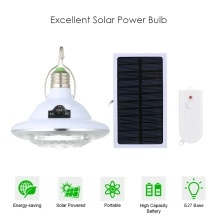 It is recharged by solar panels under sun light, bill free, energy-saving, cost-saving. With E27 standard base, can be plugged in the AC power supply socket as an ordinary light, when connected with AC power supply, the built-in battery will be charged at the same time and you can turn on it by DC power with its sensitive light control. Three power supply ways: AC power supply, solar power, battery power supply. Three illumination modes: 3 levels brightness, 22 pcs high brightness/ 18 pcs medium brightness/ 8pcs low brightness by flexible remote control. Built-in 900mAh high capacity rechargeable battery, this lamp can last 3 to7 hours when fully charged, long working time. Provided portable hanging lifting yoke, you can choose to hang it anywhere you like or carry it easily. Remote control design, you can use the remote control to turn on/off the light and adjust the brightness for convenience. 22pcs superb high bright LEDs, energy-saving, cost-saving, low energy consumption, flicker-free and anti-glare light without strobes and radiation. Mini size and light weight which is perfect for carrying. Perfect for various places such as bedroom, dormitory, outdoor camping, fishing, hiking, picnic etc . 1. Please handle with care and it is non-waterproof. 2. Please keep it away from fire.